Graveyards are on the brink of running out of space for new burials in dozens of communities across the north and north-east, it can be revealed. A Press and Journal investigation has exposed a looming capacity crisis affecting cemeteries in almost every corner of northern Scotland. The shortage of graves is poised to hit rural villages as well as significant population centres – including Elgin, Keith, Alness, Dingwall, Dornoch, Kingussie, Ellon and Banchory. Last night, local politicians demanded urgent action to avert the “unthinkable” prospect that bereaved families will soon be told they can not bury loved ones nearby because graveyards are full. Capacity concerns have already led to a ban on residents buying lairs in advance at Elgin, as well as in some areas of Aberdeen, Aberdeenshire and the Highlands and islands. And Moray Council has even considered burying the dead under cemetery paths at some sites, as it is struggling to find the cash to pay for extensions. Moray MP Douglas Ross said: “This is something that has been raised with me more than once by constituents who are extremely concerned about the future. “If plans are not taken forward, this could have the unthinkable consequence that some families and communities may not have the choice to bury their loved ones where they want to, if there are no plots available. 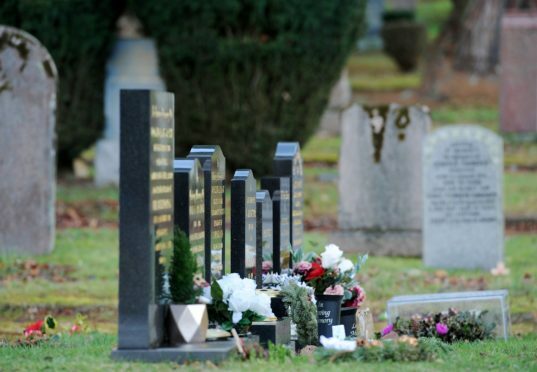 As we launch a week-long series today on the challenges faced by families as they come to say goodbye to loved ones, the P&J has published data on our website on every cemetery in northern Scotland run by councils. It shows that there are more than 150 cemeteries with fewer than 100 lairs remaining – including more than half of all the graveyards still in use in Highland, and more than 40% of those in Moray and Aberdeenshire. A total of 58 graveyards have fewer than 30 unsold spaces left, while 19 have 10 or fewer lairs still to be bought. According to Highland Council figures, there are just 12 unsold graves in Alness, 39 in Ardersier, three in Arisaig, four in Canisbay, six at Chapelhill by Nigg, 20 in Croy, 23 at Daviot, six at Dores, 30 at Dunvegan, 10 at Fodderty, and 10 at Petty-Tornagrain. There are only 20 remaining at Proncynain in Dornoch, 52 at Kingussie, 117 at Mitchell Hill in Dingwall, and 159 at Roskeen near Invergordon. Skye, Lochaber and Badenoch MSP Kate Forbes said some of her constituents had contacted her about the situation and were “understandably worried”. “Local burial grounds are incredibly important places, with most people wishing to be buried in the village or town they call home,” she said. In Orkney, there are a dozen lairs remaining unsold at Stronsay, 13 at Sanday, four at Orphir, 12 at Holm and 11 at Graemsay. And on Shetland there are 15 lairs remaining at Kirkabister, six at Laxobiggin, 14 at Vidlin, 24 at Voe, 19 at Twatt and two at South Whiteness. In Aberdeenshire, Ellon has room for 70 coffins and eight caskets, Inverurie has space for 24 caskets and 82 coffins, Daviot has space for 15, and Banchory has just 19 plots remaining. Logie Buchan has 47 spaces which are unsold, there are 51 at Cruden, Blairdaff has 16, Echt and Insch both have 22 lairs remaining, there are 10 at Keithhall, 39 at Kinellar, 40 at both Monymusk and Alvah, and 10 at Auchindoir. Strachan has 14 lairs left, Birse has eight, Tarland has nine, Tullich and Arbuthnott both have 13, there are 18 at Johnshaven, and there is one grave remaining at St Devenicks On The Hill. Robert Mackie, a Peterhead-based funeral director, said some local cemeteries were “running very low” and required extensions. Figures for Moray date back to April last year when Elgin had 251 spaces remaining and was expected to be full in six years, while Broomhill in Keith had 233 lairs left and would be at capacity in 11 years, and Lossiemouth would run out of room in 13 years. There were also 94 lairs left at Bellie in Fochabers, five at Boharm-Mulben, six at Botriphnie-Drummuir, seven at Cabrach and 16 at Knockando. Aberdeen city is now only creating new lairs at three of its 17 cemeteries, with space for 700 remaining at both Dyce and Newhills, and for 4,000 lairs at Hazlehead.